As I sit and write this blog post today, I can’t help but experience a variety of emotions. I have a hidden discouragement that is covered by a smile, but secretly I am in pain. I am in a valley. You may have been where I am as well. If you know me very well, you may now know that I lost my day job this week. Before you get upset at the company for letting me go, let me be very clear…the company I worked for was amazing in every sense of the word. I was good at what I did, but there were a few functions of the job that I simply was not wired for. As a result, they asked me to leave. I have never been terminated before, so you can imagine the feelings that were flooding my brain and heart during this conversation. The good thing is…my relationship with the leadership of my former place of employment is fully in tact, and there is no hard feelings. In fact, during the final meeting I had with my employers, we prayed together and cried. It was a decision that I think they needed to make and it will better the company. I am a bivocational pastor, so losing my full time job was quite the hit. When the words were spoken, my heart sank. Immediately I began to think about providing for my family and the malnourished bank account we already had. I was mad at God, and wondered how He could let this happen. I cried, and thought I was all alone. I felt worthless. I felt shame. I felt embarrassed. Not only was I in a deep valley…but it was a big valley. When I walked out of my place of employment for the last time, I made a promise to myself and to God. I promised that I would be open and transparent about the physical and emotional journey I was on; from the very moment I was let go. It is a hard promise to keep. I am doing this, because I think there are many people who are going through (or have gone through) this situation and wonder if the thoughts they are having are normal, and if the struggle they have is appropriate. You are not alone. Like I said…I am in a valley. You have been in this valley too. Many times. You may have not lost a job, but you have lost a loved one or wondered where the next dollar was coming from. The valley is an interesting place to be. As humans, we avoid the situations that lead us to this point, but we can all honestly say we know the feeling well. While going through times that make us feel pain, all we want to do is get away and make the hurting stop. We want to do this, because we are afraid that it will never end. Sometimes, we lose our hope and don’t know where to turn. And, when we are being led through the valley, all we can do is look up to the mountaintops and long to be there with the people that have smiles plastered on their faces. 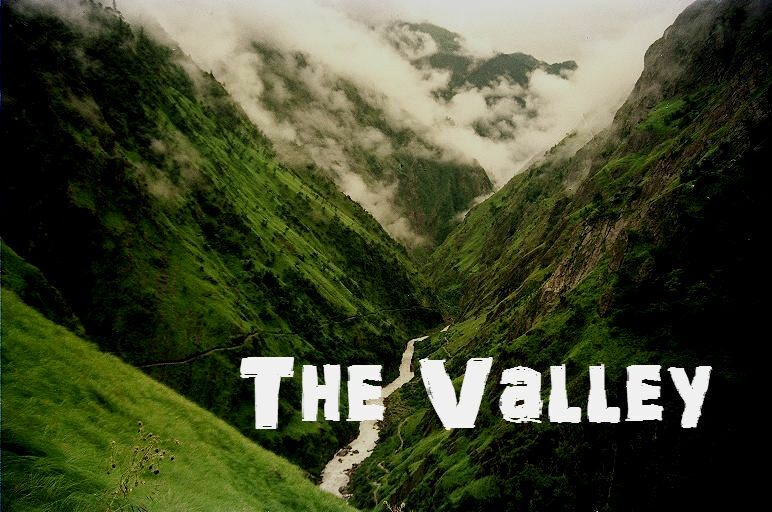 Why does God allow us to be in the valley? As I have waded through a knee-deep pile of confusion and pain, I think I may have figured something out about this mystery. As I have reflected on this illustration, I have realized that water does not stay on the mountain peaks, but always funnels down crevices and declines until it empties into the vast depths of the valley. I think this is how God’s grace works. Sometimes, we experience a more powerful display of the living water when we are going through the lowest points in our journey. Even if you are at your lowest point…I can tell you it is about to rain. Look up and receive the water. Grace is coming. All I can do at this point is look up and praise my God…and expect miracles. I am at peace. That was beautiful!!! That last part really got me! Great word and perspective! I am praying for you.